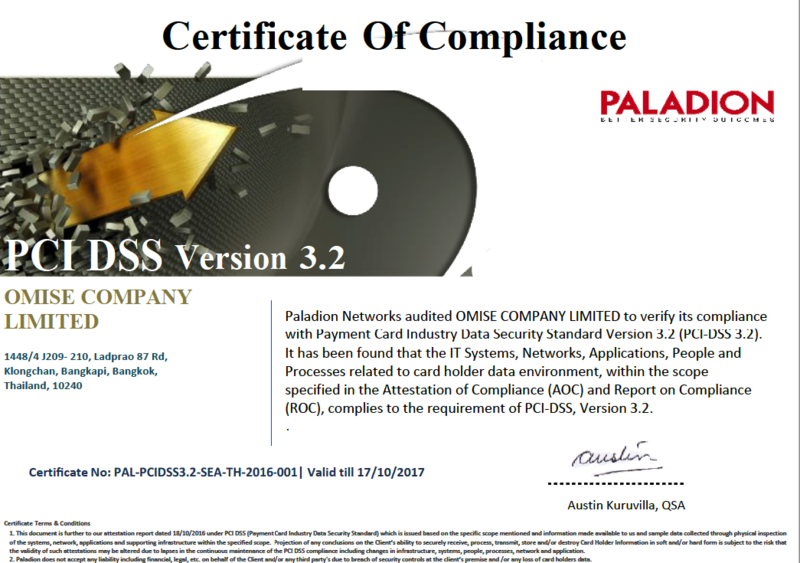 Omise, Southeast Asia’s leader in online payment processing and risk management, announced today that it has achieved the Payment Card Industry Data Security Standard (PCI DSS) version 3.2 from the PCI Council for its online payment platform, making it the first payment gateway in Thailand to receive this most recent version of the certification. PCI DSS is a comprehensive card security standard regulated by the worlds’ leading card associations; American Express, Discover, JCB, MasterCard and Visa, that evaluates a payment account data security by assessing the processor’s network and software architecture along with its security policies and data protective procedures. This attestation is required by any provider who stores, processes or transmits cardholder data. Today’s announcement further demonstrates the company’s commitment to payment security technology leadership after it announced in late 2014 that it was the first online payment gateway in Thailand to ever receive PCI compliance in all 3 scopes including storing, processing and transmitting card data.